If you’ve downloaded the latest ViewRanger update you’ll hopefully have already used Skyline, our exciting new augmented reality feature. 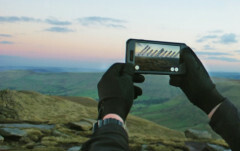 Skyline uses the camera on your phone or tablet to annotate and interact with the landscape around you by labelling peaks, lakes, towns and villages up to 20 miles away. If you’re navigating a pre-planned route, waypoints and directional arrows will also appear in front of you, showing you which way to travel. Skyline is free to use, works offline without phone or data signal, and is available almost everywhere in the world –so how can you make the most of it? 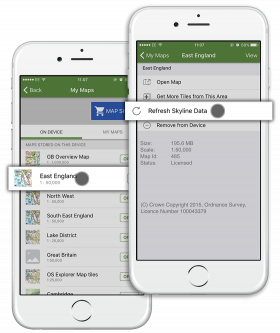 Like the rest of the ViewRanger app Skyline works offline, but for that to happen you must have the relevant area of map downloaded and stored on your device. So before you set off on your outdoor adventure, use a WiFi connection to select and save a section of mapping slightly larger than the area you intend to explore to make sure you’ll be fully covered on your trip. Skyline’s navigational arrows will only appear if you’re following a pre-planned route, so either plot your own or choose one of over 100,000 routes already created within ViewRanger. Like the maps, it’s best to download routes when you have WiFi in case you don’t have connection when you reach your destination. When you’re following a route with Skyline, waypoint boxes containing information and photographs will pop up when you get close to them. The more waypoints your route has, the more information you’ll receive while you’re walking. Although it looks great in towns and cities, Skyline’s labelling feature is at its best in open countryside with plenty of peaks on the horizon. This is when the directional arrows come into their own too, helping you navigate across featureless terrain. If you’re using your smartphone or tablet to navigate, it makes sense to get a rugged case that will protect it from bumps, scrapes and weather. But be warned that cases containing metal can interfere with your device’s compass, so in turn may affect the performance of Skyline and the ViewRanger app in general. Waterproof phone pouches are also a great way of protecting your phone from the elements without stopping you seeing what’s on the screen. If Skyline’s peak labelling looks slightly off, there are two simple and effective ways to recalibrate your device. The first is to exit Skyline and switch back to the regular 2D map screen. If you then go back into Skyline, the labelling should be more accurate. 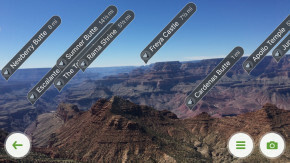 The second is it to roll your device around in your hand for a few seconds, which usually has the same effect, allowing the labels to realign themselves with the landscape. All phones have differing battery life, but keeping the camera viewfinder active for hours on end will have a negative impact on any device. The best thing to do is either exit Skyline when you aren’t using it and revert back to your regular ViewRanger map view, or lock your screen when you aren’t looking at it. Skyline also works in Airplane mode which is a great battery saver, while activating Low Power Mode in your battery settings (if available on your device) has a similar impact. If you’re planning a long trip, it’s also a good idea to carry a portable power pack to recharge your phone. Skyline is designed as a navigational tool, but shouldn’t be solely relied upon for decision-making. The directional arrows will only ever be as accurate as the route that they’re following and rely on the quality of your phone’s internal compass, so stay alert and always be aware of your surroundings before making a decision on which way to walk.